Sharing the paths is easier and more pleasant when we’re all courteous and understanding — and we should encourage courtesy and understanding — but I think the problem we’re running into here is rooted in the physical design of the multi-use paths, and the assumption that they should be able to accommodate people moving at very different speeds in different directions. The right-of-way available to the paths is limited along our greenways, making it difficult to widen them and accommodate the separation of bike and pedestrian modes, but sharing space amongst users that travel at 15 mph and 3 mph in different directions necessarily means a lot of fairly high speed interactions — with or without electric bikes, as the Letters to the Editor from several months ago highlighted. At low utilization you can get away with the current arrangement because conflicts are fairly rare, but as more people want to get around by walking and biking — for both recreational and utilitarian purposes — I think this issue is just going become more urgent. I think we’ll also start to see problems in other pieces of our bike infrastructure. For instance, over the last several years the city has created a lot of right turn lanes for cars at signalized intersections. Often the bike/ped crossing is raised, and given a different surface treatment to alert drivers to the possibility of conflict at these crossings. Apparently they do a pretty good job of this, based on accident statistics as reported by Bill Cowern, the city’s traffic engineer. However, this treatment results in bikes and pedestrians waiting on a small island for the signal to change. When you have one or two bikes waiting, that’s functional. When you have 10 bikes waiting, it’s not, because they back up across the right turn lane. We’ve done a fairly decent job of designing and building bike infrastructure that lets the enthusiastic self-identified “cyclist” demographic use our public rights of way. However, these people only make up about 10% of the public. If we want to get more people riding for transportation, we’re going to have to do something different. The city of Portland, Oregon has identified four different broad types of cyclists, and the classification has held up well in other cities too. It shows that there’s another 60% of the population that is “interested but concerned” — they’d like to bike more, but (understandably!) they don’t feel comfortable sharing space with cars. If we’re really going to aim for anything like Biketopia, and a dramatic reduction of the greenhouse gas emissions related to our transportation system, we have to make cycling attractive to this part of the public. Interested but concerned folks tend like the multi-use paths, but you can’t get to a lot of destinations on MUPs alone, so it’s not really a complete transportation infrastructure solution. Large differences in speed and mass of different road users in the same space must be eliminated as much as possible. Road users can best be forced to travel at lower speeds by road design. This works better than signs. If crashes occur at lower speed differences they cause a lot less damage to the most vulnerable road user. Where speed differences cannot be eliminated types of traffic must be separated. On roads with higher speeds road users travelling in opposite directions should be separated by a division as well, to further eliminate conflicts. Cycle paths and pedestrians are always separated from these through roads, following the principle of homogeneity of mass as well as speed. Because of this principle the Dutch will never implement a combined bus/cycle lane as is common in some other countries. Instead there are bus lanes separated from other motorized traffic because the mass of cars and buses do not match either. Eliminating crossing movements is possible with roundabouts because on roundabouts traffic flows in less conflicting directions than on an ordinary traffic junction. Going forward, as we strive to make cycling attractive as transportation to a larger demographic in Boulder and the US, including especially children, families, women, and the elderly, I think we’re going to have to embrace much more of this kind of design. 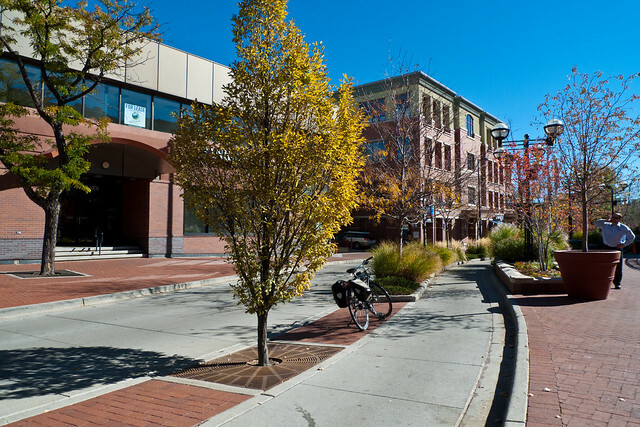 Martha Roskowski, former head of GO Boulder, is working on this with Bikes Belong, a Boulder-based national bike advocacy organization, under the Green Lane Project. What does all this mean for the multi-use paths? In some cases, I think we’ll be able to upgrade the greenway paths to accommodate both bikes and pedestrians without mixing them, but in a lot of cases that will prove problematic because of limited rights of way, and the intrinsically sinuous nature of some greenways. I think the real solution is to create a well connected, low-stress network of bikeways on and along our streets that are attractive to everyone — including families with small children — allowing them to alleviate some of the bike traffic on the paths. When people are just trying to get from point A to point B efficiently, they’ll often choose to use the street-level network since the greenways are rarely the most direct route. How we can create a bike network that appeals to everyone — not just a minority of enthusiasts — is one of the things we’re talking about this year as the city updates its Transportation Master Plan. You’ll see some new stuff out on the streets in the coming months — details of which can be found on the city’s Complete Streets page. If you’d like to bike more in the city, but don’t feel comfortable with some of our existing bike lanes or routes, please let the city know, and sign up to give feedback on the plan with the TMP update comment form. Unfortunately, I don’t have any suggestions for short term fixes to the bike/ped conflicts on the busiest parts of our paths. I wish I did! But at the same time, I don’t think it’s likely that “allowing” e-bikes (which do already use the paths) is going to make the problem noticeably worse. This entry was posted in journal and tagged bike, conflict, creek, ebike, electric, path, pedestrian. Bookmark the permalink. As a cyclist, I’ve learned to vary my speed considerably: I often ride at under 10 mph when there is considerable pedestrian traffic, but when traffic is clear, I speed up as much as feels safe. At no time do I put my own desires above those of other users of the paths, and that is the key. No single person’s desires are more important than anyone else’s. it’s only by respecting each other that we can make shared infrastructure that is completely inadequate work. I started the ebike petition http://petitions.moveon.org/sign/legalize-ebikes-on-boulder which got started the City’s website, survey, etc If ebikes double cycling in Boulder, which I think likely within 5 yrs, we’ll have to widen the Creek Path (or add a separate ped lane) from about 6th St. to Folsom Ave.
Once cycling really takes over, as it has in Amsterdam (47% of commute trips), Copenhagen (52%) and Groningen (59%) then it will be much safer to cycle on Boulder streets, and people will have less need to use the paths to feel safe. 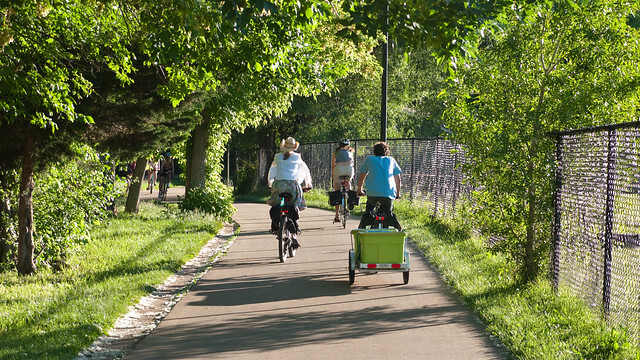 Yes, it’s hard and expensive to widen the greenways, but they are one of the biggest draws to Boulder, and worth the money. I’ve lived here 35 years. A good deal of Boulder Creek was “channelized” when I moved here, so much of the creekbed in town was made to look the way it is, it didn’t arise naturally. Is is important not to group all e-bikes together as there are important differences. Bikes with high powered motors (400 watts and larger) are capable of very high speeds and acceleration. In the words of one advertisement for a bike with a 600 watt motor “blurring the line between a bicycle and a motorcycle”. These have no business sharing a path with pedestrians. The other major danger is e-bikes that are equipped with throttles. They often surprise other bikers, pedestrians, and cars because they do not move like bikes usually move. Body language is very important when sharing spaces and normally when a biker accelerates, it is readily apparent to everyone around. They should not start to act like motorcycles, and not accelerate faster than Lance Armstrong. (Lance was once documented as maintaining a 500 watt output for a full hour.) Bikes using shared paths should behave like bikes, and this means motors less than 400 watts, and no throttles.